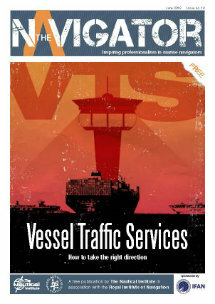 MAIB released this month its Safety Digest for the second semester of 2012. Among others one case refer to an incident where an explosion caused the poop deck to completely detach from the vessel and land on the compartment funnel deck. Hotwork repairs were being carried out on the carcass of the cargo discharge chute. Both the repairs and cargo operations were proceeding well when a fire was discovered on the vertical cargo discharging conveyor belt. The fire quickly spread through the conveyor tower and into the accommodation area. The heat transferred through the adjacent bulkhead and through a doorway which had been left open into the Engine Room. As the fire moved into the steering gear compartment, there was a severe localised detonation as a stowage of “ship’s-use” chemicals, including oxidisers, interacted with each other. It is likely that the chemicals mentioned above interacted making a small detonation caused the poop deck to lift, allowing air to mix with the compartment’s hydrocarbon-rich atmosphere, created by the release of oils stowed there and from the various hydraulic systems. 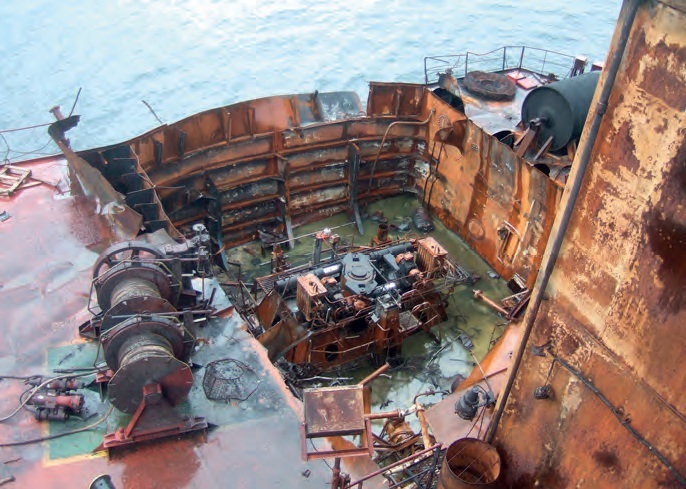 The resultant explosion tore off the entire poop deck, fully exposing the steering gear compartment (Figure 1), and landing it on the funnel deck (Figure 2). Fortunately, there were only minor smoke inhalation injuries. The fire was most likely to have been caused by hotwork repair debris falling from the cargo hopper at the top of the tower into the side curtain of the conveyor belt. 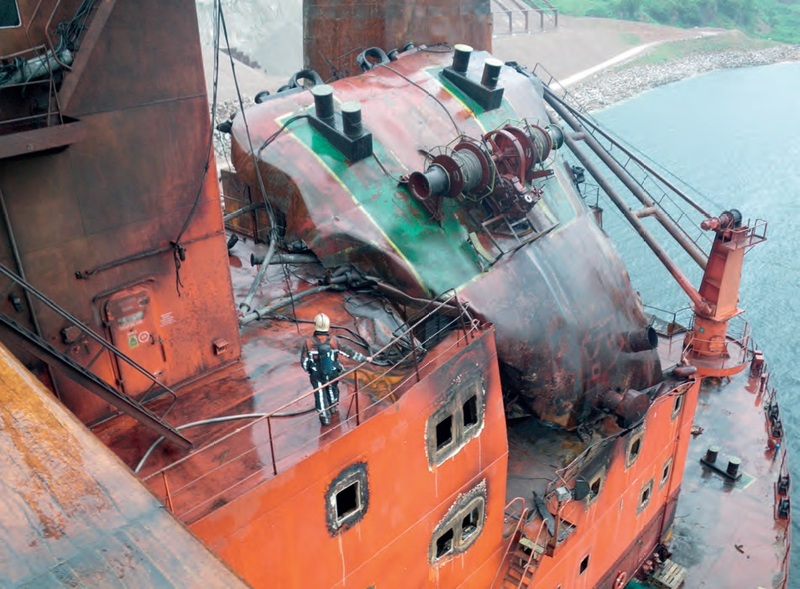 The hotwork repair had been authorised by the ship’s manager, but other hotwork relating to the regular repair to the high tensile steel hull, carried out at the same time, had not. There were violations of the company’s hotwork procedures, including not keeping a constant fire watch, no dedicated fire watchman being nominated and work being routinely undertaken in unauthorised areas. The cargo handling space was very large and not designed with any method of division. The door into the engine room workshop was hinged and required bolting to be securely shut; it was poorly designed for fire containment purposes. Other doors and vents were left open, making the fire-fighting effort very difficult. This was especially so as there was no fixed fire-fighting system fitted in the cargo-handling space, and none was mandatory. In addition, the drill schedule did not specify that fire drills were to be carried out in the cargo handling area despite the high fire risk relating to the conveyor belts and potential difficulties in fighting a fire in the area. It is essential that hotwork controls are strictly adhered to and that auditing procedures assess compliance. Containment is an essential element of controlling fire spread. Doors and hatches should be easily opened and closed. Crew should be drilled in dealing with fires in all areas of a ship and, where particular high risk areas are identified, these should be specified in the drill schedule. The stowage guidance contained in the respective Material Safety Data Sheets should be complied with and the random stowage of chemicals should be avoided. SMSs should provide guidance on the management of radiation sources, and risk assessments should include the hazard where appropriate.